The day is forever etched in my mind. I was in the third grade and when I arrived at school all the kids were in a frenzy. It was election day 1960 and the rumors were swirling that if John Kennedy, a Catholic, won, we were going to have to go to school on Saturdays!!! Election Day. Kennedy. Nixon. School on Saturday. Vote. These were words that were foreign to my innocence, naive mind. We did not have TV at home. Daddy listened to the radio in the barn while he milked the cows but it was seldom on in the house. My parents never voted and I don’t remember them ever talking about politics. They did keep up with what was happening as I remember that earlier in the year President Eisenhower’s plane landed at the small rural Weyers Cave airport south of Harrisonburg. My parents kept us out of school that day to go see him. I remember the excitement of seeing the plane come in for landing and the President of the United States descending the steps and shaking hands with various bystanders. Just as he got to daddy’s hand he turned and daddy was missed. I had no clue who Kennedy or Nixon was but I immediately knew that I did not like Kennedy and if he won the election our country was in big, BIG trouble. The first order of the day at school that morning was to vote. I carefully wrote the name Nixon on my paper. I had voted. The only other memory I have of the election that year was going across the road to my newly married uncle’s house and seeing a Newsweek laying on their coffee table with pictures of the “evil” and other candidate on the front. It was the first time I had seen their pictures and I was intrigued. I wished we got a magazine like that at our house. Kennedy won that election and we never had to go to school on Saturday! This year our trees are loaded with fresh pecans. Gene grew up with pecan trees in Newport News and when they moved to Powhatan, they brought some trees with them. We are on the edge of being too cold here but they do really well for us. 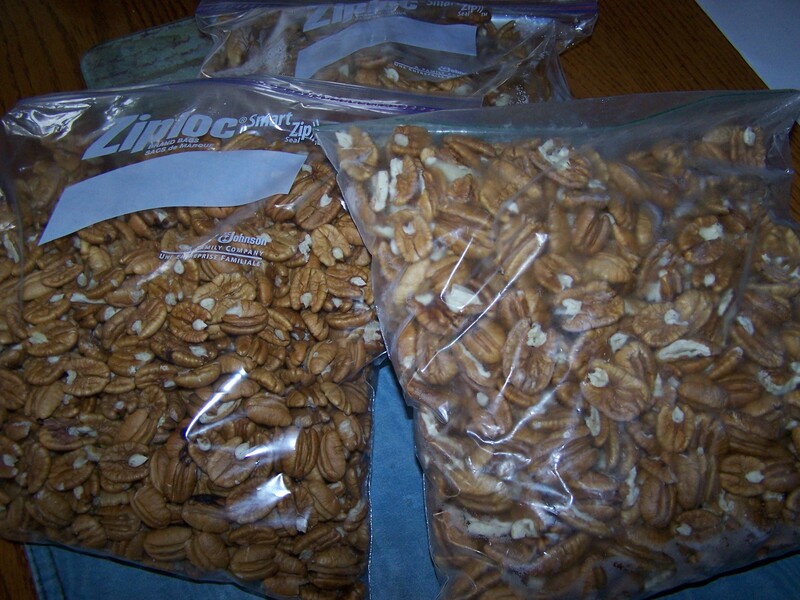 Pecans are always the last trees to get their leaves in the spring and the last to loose them in the fall. During the summer the pecans grow encased in a green hull (upper left hand corner of the picture). When they are ripe the hull turns brown, splitting open and releasing the pecan to fall to the ground. If the pecan falls with the green hull still attached they are not any good. Not every year is a good year. 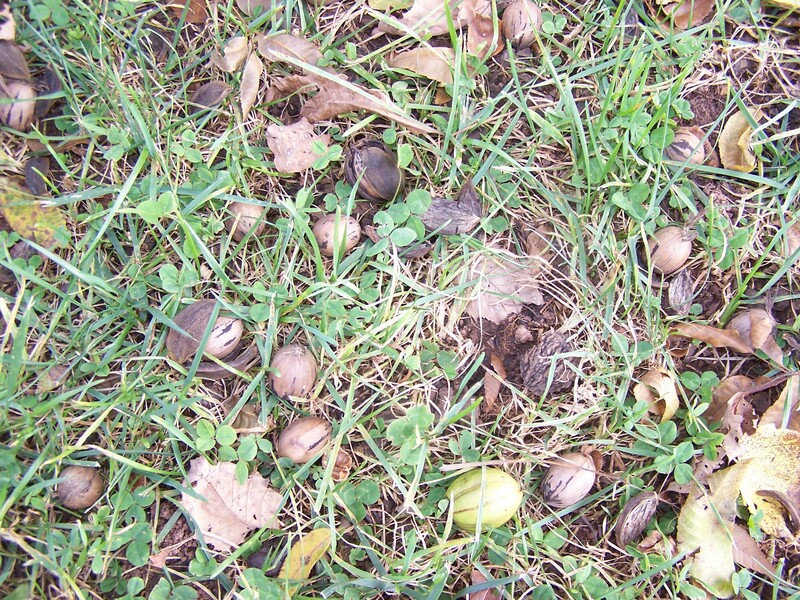 Last year we didn’t get any but this year the ground is covered with hundreds of pounds of nuts from our two trees. 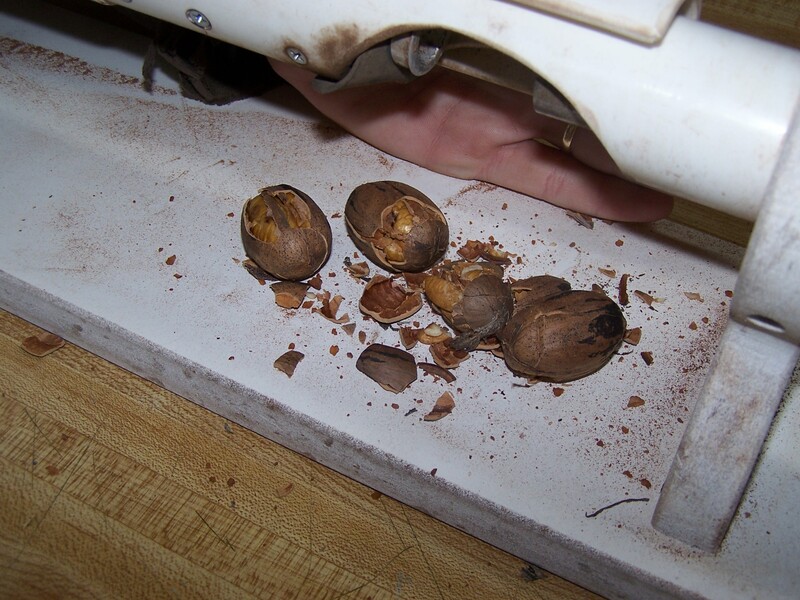 I have an electric nut cracker to crack the shells on the pecans but we have to pick them out by hand. Since we don’t live in “pecan country” they are no hullers around. 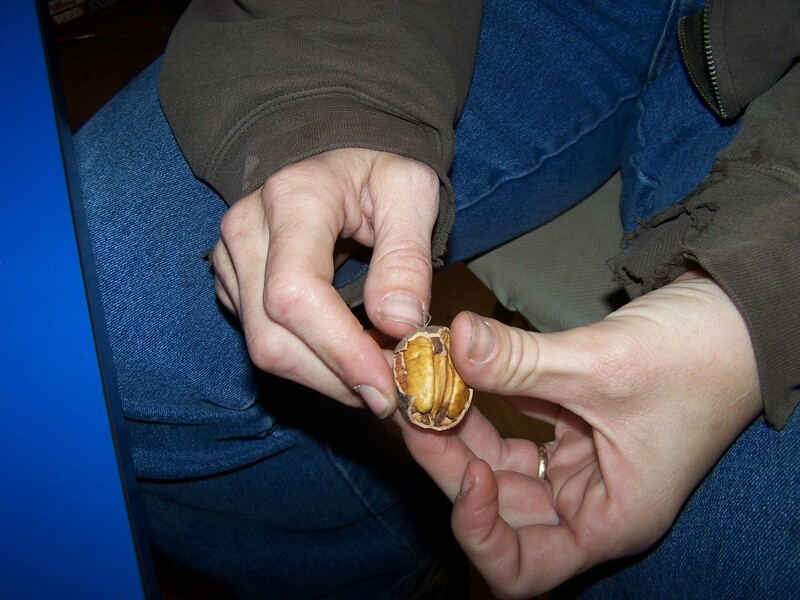 We put the nut into the shaft of the cracker and it cracks the nut and drops it out. This saves us some time and makes them easier and faster to shell.